Atherton Knowles is a patent, design and trade mark firm. We were founded in July 2014 by James Knowles. James is a Chartered (UK) and European Patent Attorney, European Trade Mark and Design Attorney with over 17 years’ experience in intellectual property. James has a degree in chemistry and a PhD in chemistry from the University of Exeter, UK. After postdoctoral work in polymers, materials and environmental chemistry, he worked as a research scientist for Pilkington plc before moving to the in-house patent department at Pilkington. James subsequently worked for 10 years at a private practice firm as a patent attorney and partner before moving back to corporate practice at 3M in the UK. He set up Atherton Knowles in July 2014. James won the Moss prize for the examinations of the Chartered Institute of Patent Attorneys in 1998. He qualified as a Chartered and European Patent Attorney in 2002. James is a trade mark and design representative before OHIM (the European Union trade marks and designs office). James has a wide technical expertise including in chemistry, materials technology, textile technology, polymer technology, food science, metallurgy and pharmaceuticals. He has extensive experience of prosecuting patent applications before the UK and European Patent Offices and in other jurisdictions and in successfully opposing granted European patents. James has appeared in many hearings before the Opposition Divisions and Boards of Appeal of the EPO. James was a visiting lecturer of the University of Westminster and regularly gives lectures and workshops on intellectual property protection. Andrew is a Chartered (UK) and European Patent Attorney. He has a degree in biological sciences from the University of Birmingham and is a Member of the Royal Society of Biology. Andrew worked as a research scientist for a plant biotechnology company before moving to manage the company’s international patent portfolio. He qualified as a European Patent Attorney in 2001 and has worked in private practice since 2002. His practice focusses on filing and prosecuting patent applications before the UK and European Patent Offices. Andrew has particular experience in the chemical and life science sector, including gene expression, immunology, pharmaceuticals, vaccines, diagnostics, gene therapy and medical devices, as well as diverse mechanical subject matter. Andrew has represented clients from independent inventors to multinational companies. 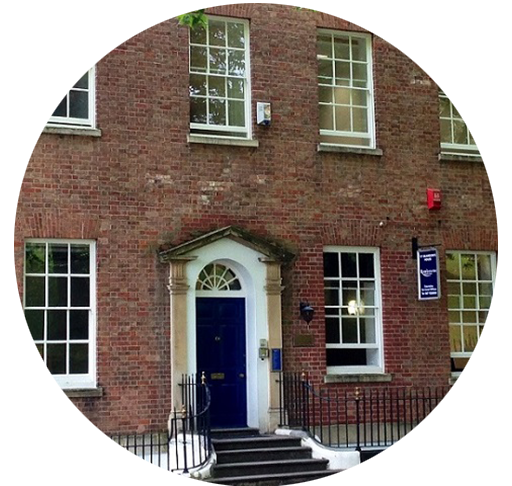 Our offices are in a modernised Georgian building in the commercial centre of Bristol, a city about 120 miles west of London and 45 minutes from the UK Intellectual Property Office. Bristol has excellent road, rail and air links to the rest of the UK, mainland Europe, North America and the rest of the World.